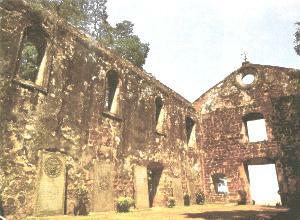 In the year 1548, the chapel was given by the archbishop of Goa, Don Albuquerque to the Society of Jesus. St.Francis Xavier received the title deeds on behalf of the Society. The chapel was highly venerated by the Portuguese, as it was here, that St. Francis Xavier preached and said Mass on Sundays. He used to pass long nights in prayer here. Often his friends and admirers used to peep through the crevices of the doors to find out what the saint was doing. At times, he was found wrapped in ecstasy with his whole body raised above the ground.4 The same thing happened when he distributed Holy Communion. He used to administer the Sacrament on his knees, as the communion rail was low and the kneeling position seemed easier. It was in this chapel that he wrote at least five letters in the dim light of a candle. The remains of the saint's body rested in this chapel from the 22nd of March, 1553 to the 11th of December of the same year. By 1556, the chapel needed repairs and it was at this time, that the question arose, whether to pull it down completely and build a new church, or to extend it. It was highly venerated by the Portuguese. In fact, it was the second christian place of worship ever built in Malacca. It was hard to accept the fact to pull it down. So, it was decided to retain part of the walls and the facade of the church, the windows and walls up to the side doors inclusive. The old chancel and vestry were pulled down and the Church extended towards the east. The wal Is of the nave were extended and three windows were opened, in the style similar to the arch of the sanctuary. The sanctuary walls are thicker than those of the nave. The walls of the chancel were extended to the south forming two apartments The ground floor, served as vestry, with two doors, one communicating with the chancel, and the other with the hill to the west. On the ground floor, there is a window opening to the east, viewing the other side of the hill. One notes that the parapet is thinner than the wall, The style of the windows built can be seen, even today, in old Portuguese homes. The first floor served as a residence, with three large windows to each side of the three walls. Today, these windows are walled up. By 1567, the church had not been completed, for a letter written during that date says: "The church is not yet finished". It gives its dimensions as 110 palmos long, 46 broad and 39.5 high. One palmo equals to 0.22 metres. In 1641, the Dutch took Malacca from the Portuguese and used the church for their reformed religion. 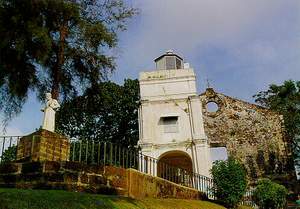 It was abandoned by the Dutch as a place of worship, after the building of the present Christ Church, at the foot of the hill, by the side of the Malacca Post Office. The new reformed church seems to have been built in 1741, to commemorate the centenary of the occupation of Malacca by the Dutch. Today, the building is used as an Anglican Church. From about 1741 the old church of St.Paul became part of the fortress. The tower was demolished, and in the annex, 'a wide pillar was erected to strengthen the building. 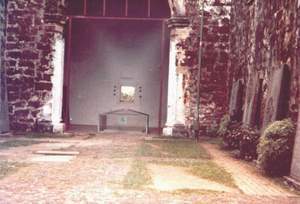 The ground floor in the annex and also in the chancel was raised, in the former, partly to cover the arch supporting the pillar, and partly to place a cannon facing the sea. The chancel was also raised in order to place another cannon which would face the fort of St John. Some of the windows and doors were closed and the nave of the church became a graveyard with monuments tombstones scattered here and there.